I have a love hate relationship with youth hostels. One minute they make me feel young, vibrant and totally on top of the world. The next they’ve got me swearing I’ll never stay in one ever again. There’s nothing quite like tossing and turning in a sleepless state of despair when the traveller in bunk one snores like he was a kango hammer out of control. However, having lived and worked behind the scenes of a youth hostel for almost one year, I suppose I’ll never escape the temptation to see if I’ve still got what it takes to stay in one. After all, my all time favourite hostelling moments are treasured memories which I wouldn’t have changed for any five star lodging in the world. 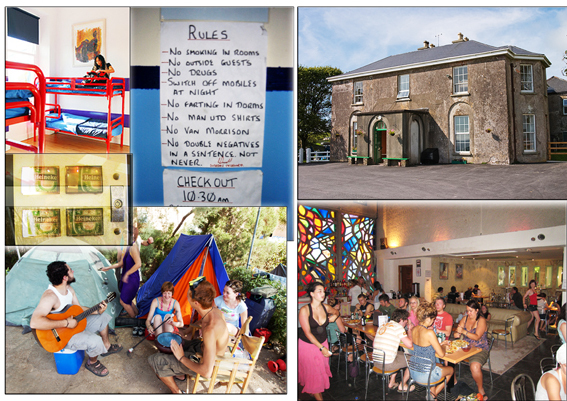 Let me just make one thing clear – Irish hostels are in a league of their own. Like a reflection of the Irish, the hostels are full of friendliness and fun. I will always have a soft spot for Sheila’s Hostel in Cork where I lived and worked for almost a year, but there are plenty of others to which I would happily return. Ballintaggart on the Dingle peninsula is one of them. It’s such a gem of a place! In their huge country kitchen you’ll find yourself doing your dishes (yes! it’s a hostel, remember) side by side with one of their free range peacocks. Their courtyard was used as a soup kitchen during the famine and their horses are always up for a trot. The very best moments at hostels are always those you share with your new travel buddies from around the world. This is where hostels differ the most from staying in a hotel. Hostels are designed for young at heart travellers who don’t only want to share a bedroom with their new friends, they also want to pick their brains about the best stir fry in town. Where to party, where to eat, where to catch the bus to the beach, where to go surfing – that kind of thing. I’ve met great people at hostels, really wonderful people who are still my friends today. I’ve learned how to cook a Spanish tortilla by Serafino, how to appreciate rugby by Daniel the Australian, how to make a proper Irish stew by Liam, how to look at architecture by Basil and how to recover from a flu by Frenchie Jerome. Sheila's bunks on the upper left, Ballingtaggart on the upper right.